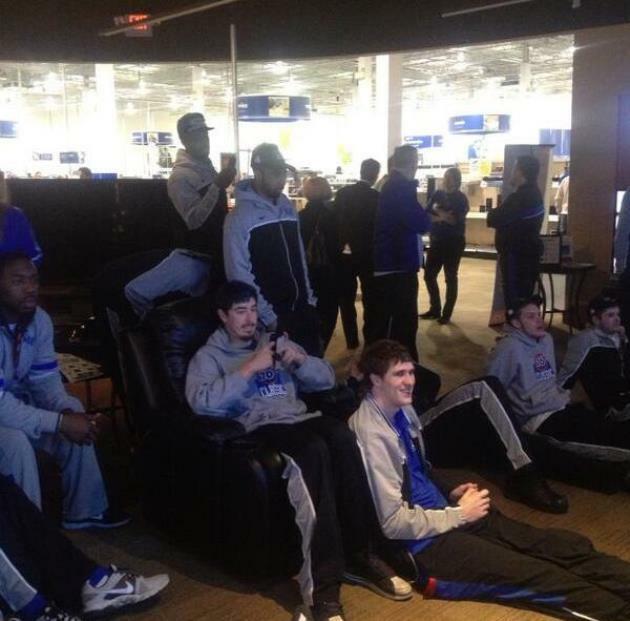 Imagine going in to Best Buy on a Sunday afternoon to get a DVD, maybe a new laptop, and seeing one of the top teams in college basketball sprawled out in front of the televisions watching to see where it will be seeded in the NCAA tournament. Saint Louis had one of the most unusual NCAA selection show watch parties you'll ever hear about. After winning the Atlantic 10 championship at the Barclays Center in Brooklyn, the Billikens wanted to rush to the airport to see the broadcast of the NCAA tournament selection show. And for good reason. A team hanging out with each other, watching to see its name shown on the bracket and then cheering wildly when it pops up is a March tradition. But then Saint Louis got stuck in traffic. It wasn't going to miss the show. So it improvised. So yeah, the patrons of the Best Buy in Secaucus got to shop as the Atlantic 10 men's basketball champions posted up in the home theater section to watch CBS. That doesn't happen every day. It made for a memorable evening for Jen Hart, general manager of the Secaucus Best Buy. "I brought them in the Magnolia room and the next thing I know there 30 guys there," Hart said. "A couple of minutes later, they all started screaming. They thanked us 100 times, helped move the chairs back and got on the bus. Customers were asking what was going on. It was really cool. They were really nice guys." Saint Louis got a No. 4 seed, and had its special moment seeing its name in the bracket before getting back on the bus and going to the airport. And if the Billikens have any travel issues on the way to San Jose, the site of their first NCAA tournament game, at least we know they'll be quick on their feet with a solution.